Terms - Appalachian Log & Timber Homes - Rustic Design for Contemporary Living. The following terms and conditions (the “Terms and Conditions”) govern your use of Appalachian Log Homes, Inc.’s (“Appalachian Log & Timber Homes”, “ALH”, “we” or “us”) website (the “Site”). This Site is made available by Appalachian Log Homes, and as such, we may change the Terms and Conditions from time to time, and at any time, without notice, by posting such changes on this Site. By using this Site, you ACCEPT AND AGREE to these terms and conditions as applied to your use of this Site. If you do not agree to these Terms and Conditions, you are prohibited from the access and use of this Site. 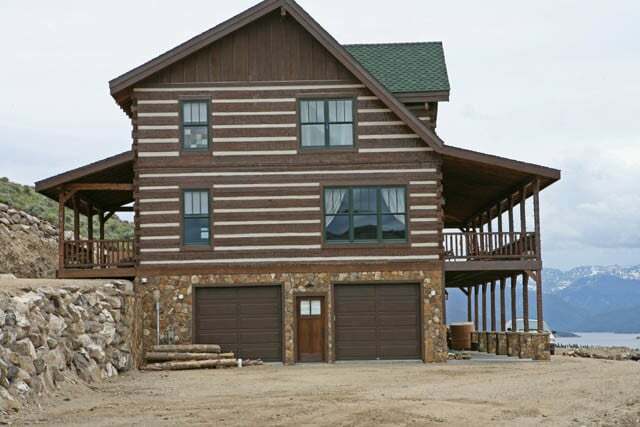 Appalachian Log Homes maintains and operates this Site from our offices in the United States. We do not represent that information contained on this Site are appropriate or available for use in other locations. Individuals who access this Site from other locations are responsible for compliance with local laws as applicable. Appalachain Log Homes owns, solely and exclusively, all rights, title and interest in and to this Site, all the content, code, data and materials thereon, the look and feel, design and organization of this Site, and the compilation of the content, code, data and materials on this Site, including but not limited to any copyrights, trademark and service mark rights, patent rights, database rights, moral rights, sui generis rights and other intellectual property and proprietary rights inherent therein or appurtenant thereto. Your use of this Site does not grant to you ownership of any content, code, data or materials you may access on this Site. Any commercial distribution, publishing or exploitation of this Site is strictly prohibited. You may view the content on this Site on your computer or other internet-compatible device, and make copies or prints of the content on this Site for your non-commercial, educational or personal use only. Any copies you make must retain Appalachian Log Homes proprietary notices, including its copyright notice, and may not be altered in any manner. You may not otherwise copy, reproduce, publish, display, distribute or otherwise exploit any content, code, data or materials on this Site. If you make other use of this Site, except as otherwise provided above, you may violate copyright and other laws of the United States, other countries, as well as applicable state laws and may be subject to liability for such unauthorized use. The trademarks, service marks and logos displayed on this Site are registered and unregistered trademarks or service marks of Appalachian Log Homes and/or others. Nothing contained on this Site should be construed as granting, by implication, estoppel or otherwise, any license or right to use any trademark or service mark displayed on this Site without the express written permission of Appalachian Log Homes or such third party that may own such trademark or service mark. Your misuse of the trademarks and service marks on this Site is strictly prohibited. You acknowledge and agree that we have no responsibility for the information, content, products, services, advertising, code or other materials which may or may not be provided by or through web sites to which you may link from this Site (collectively, “Linked Sites”). Links to Linked Sites do not constitute an endorsement by us of such web sites or the information, content, products, services, advertising, code or other materials presented on or through such web sites. Appalachian Log Homes shall not be held responsible should you encounter any material on Linked Sites that is or may appear indecent, illegal, or inaccurate. THIS SITE, INCLUDING, WITHOUT LIMITATION, ALL SERVICES, CONTENT, FUNCTIONS AND MATERIALS, IS PROVIDED “AS IS,” “AS AVAILABLE”, WITHOUT WARRANTY OF ANY KIND, EITHER EXPRESS OR IMPLIED, INCLUDING, WITHOUT LIMITATION, ANY WARRANTIES OF TITLE, NON-INFRINGEMENT, MERCHANTABILITY OR FITNESS FOR A PARTICULAR PURPOSE, AND WE HEREBY DISCLAIM ANY AND ALL SUCH WARRANTIES, EXPRESS AND IMPLIED. NO ADVICE, RESULTS OR INFORMATION, WHETHER ORAL OR WRITTEN, OBTAINED BY YOU FROM US OR THROUGH THIS SITE SHALL CREATE ANY WARRANTY TO THE MAXIMUM EXTENT PERMITTED BY APPLICABLE LAW. THE CONTENT OF THIS SITE IS DESIGNED TO PROVIDE INFORMATION ON MATTERS OF INTEREST AND THE SERVICES AVAILABLE FROM APPALACHIAN LOG HOMES, INC. ONLY, AND DOES NOT CONSTITUTE PROFESSIONAL ADVICE OF ANY KIND, NOR ANY OTHER ATTEMPT TO SOLICIT BUSINESS OR OFFER SERVICES. SINCE LAW AND REGULATIONS CHANGE CONTINUALLY AND ERRORS CAN OCCUR, THE INFORMATION ON THIS SITE MAY NEITHER BE UP TO DATE NOR ACCURATE. APPALACHIAN LOG HOMES, INC. ACCEPTS NO LIABILITY FOR ANY LOSS ARISING AS A RESULT OF ANY ACTION TAKEN OR REFRAINED FROM AS A RESULT OF INFORMATION CONTAINED ON THIS SITE OR ANY OTHER SITES TO WHICH THIS SITE MAY BE LINKED AND APPALACHIAN LOG HOMES, INC. SHALL HAVE NO OBLIGATION TO UPDATE THIS SITE. PLEASE CONTACT APPALACHIAN LOG HOMES, INC. FOR SPECIFIC ADVICE ON ANY AREA OF INTEREST. IF YOU ARE DISSATISFIED WITH THIS SITE, YOUR SOLE REMEDY IS TO DISCONTINUE USING THIS SITE. NOTHWITHSTANDING ANY PROVISION OF THESE TERMS AND CONDITIONS, IN NO EVENT SHALL APPALACHIAN LOG HOMES, INC., OR ANY OF ITS PARTNERS, DIRECTORS, MEMBERS, OFFICERS, EMPLOYEES, AGENTS, AFFILIATES, OR CONTENT OR SERVICE PROVIDERS (COLLECTIVELY, THE “PROTECTED ENTITIES”) BE LIABLE FOR ANY DIRECT, INDIRECT, SPECIAL, INCIDENTAL, CONSEQUENTIAL, EXEMPLARY OR PUNITIVE DAMAGES ARISING FROM, OR DIRECTLY OR INDIRECTLY RELATED TO, THE USE OF, OR THE INABILITY TO USE, THIS SITE OR THE CONTENT, MATERIALS AND FUNCTIONS RELATED THERETO, LOST BUSINESS OR LOST SALES, EVEN IF SUCH PROTECTED ENTITY HAS BEEN ADVISED OF THE POSSIBILITY OF SUCH DAMAGES. SOME JURISDICTIONS DO NOT ALLOW THE LIMITATION OR EXCLUSION OF LIABILITY FOR INCIDENTAL OR CONSEQUENTIAL DAMAGES SO SOME OF THE ABOVE LIMITATIONS MAY NOT APPLY TO CERTAIN USERS. IN NO EVENT SHALL THE TOTAL AGGREGATE LIABILITY OF THE PROTECTED ENTITIES TO YOU FOR ALL DAMAGES, LOSSES, AND CAUSES OF ACTION (WHETHER IN CONTRACT OR TORT, INCLUDING, BUT NOT LIMITED TO, NEGLIGENCE OR OTHERWISE) ARISING FROM THE TERMS AND CONDITIONS OR YOUR USE OF THIS SITE EXCEED, IN THE AGGREGATE, THE AMOUNT, IF ANY, PAID BY YOU TO APPALACHIAN LOG HOMES, INC. DIRECTLY IN EXCHANGE FOR YOUR USE OF THIS SITE. The Terms and Conditions and the relationship between you and us shall be governed by the laws of the State of Tennessee, without regard to its conflict of law provisions. If any dispute, controversy or claim arises under the Terms and Conditions, and this Site in general, and cannot be resolved by facilitated negotiations (or the parties agree to waive that process) then such dispute, controversy or claim shall be settled by arbitration. The arbitration proceeding shall take place in Knox County, Tennessee, unless the parties agree to a different locale. The proceeding shall be governed by the provisions of the Federal Arbitration Act (“FAA”) or, if a court of competent jurisdiction determines the FAA inapplicable, by the laws of the state in which the proceeding is to take place. In any arbitration instituted hereunder, the proceedings shall proceed in accordance with the then current Arbitration Rules for Professional Accounting and Related Disputes of the American Arbitration Association, except that no pre-hearing discovery shall be permitted unless specifically authorized by the arbitration panel.